Post #17 of #49 – Over the next 24 hours I will be raising funds for the Union Gospel Mission during Blogathon 2009 by writing a blog post every 30 minutes. Please consider donating to my cause to keep my going until 6am PT July 26th. 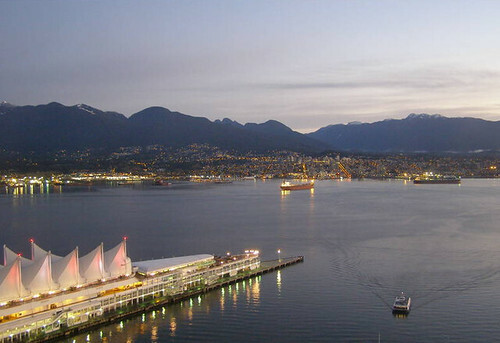 All morning I’ve been watching the SeaBus come and go from the harbour right in front of me so I thought it warranted its own Blogathon post. 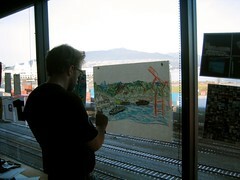 Many think that the SeaBus began operation in 1985-86 when our faithful Skytrain lines opened up. However, the passenger-only ferry crossing from downtown to the North Shore has been wave-hopping since 1977. As my friend Dave says, it’s the “$3.75 Harbour Cruise”. The quick trip isn’t the most luxurious but the scenery is just gorgeous (and it sure beats sitting in traffic for hours to cross one of the bridges). That’s a lovely view. Keep up the good work! 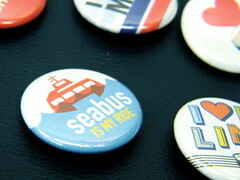 Seabus! Many often forget or don’t know that the original colours in 1977 were “hallowe’en-orange” upon delivery and first service. Now that you mention it- I DO remember those orange Seabuses! I remember the orange Seabuses as well…so long ago now!